In Denmark a good result at the Eurovision Song Contest can make you a star loved by everyone, but a bad placement can destroy your career. A media is now warning the broadcaster to take better care of Soluna Samay than they have done with other artists. The Danish national final, Dansk Melodi Grand Prix, and the Eurovision Song Contest can be a great platform to kick off your career, but it can also break it, if you don’t do well. Danish media, BT, is now warning the Danish broadcaster DR, to take better care of Soluna Samay than they have done with other artists returning home with a disapointing result from the Eurovision Song Contest. They use two examples: Tommy Seebach and Malene Mortensen, in their open letter adressed to DR, but more than be added as they are not the only ones. It is no secret that the alcohol problem that ended up killing Tommy Seebach 10 years later really increased after his low placement at the Eurovision Song Contest in 1993, where he represented Denmark for the third time. He expirienced that the entire music industry – and in particular DR turned their back on him. Just a couple of months earlier he was the big hero when he won the Dansk Melodi Grand Prix with Under Stjernerne På Himlen, now he had betrayed his country with a bad result. When Malene Mortensen in 2002 represented Denmark at the Eurovision Song Contest with the song Tell Me Who You Are Denmark was tipped as a winning candidate, but instead ended up last with only 7 points. BT however points out that an internal EBU report stated that Romania had been buying votes and as such Malene actually finished 23rd just as Soluna Samay just did. Malene was hit by the same faith as Tommy Seebach and it took her a long time to get to where she is today, where she is an established jazz singer. The only one who didn’t turn his back on her was Tommy who had tried it himself. This was shortly before his death and he wasn’t feeling well, but through a friend he sent her flowers and a message saying: "I have tried it myself. Back then everyone turned their back on me. In particular DR. You are good enough, Malene. A good singer. Believe in yourself. Don’t let the others tell you something else." Malene was just 19 years old and in the time after the Eurovision Song Contest she went through some very difficult times, but the message from Tommy Seebach meant a lot to her. The next one to through these difficult times is now Soluna Samay and as BT puts it to DR: "Soluna has just experienced a choking, surreal event, which can be hard to cope with for such a young woman. It is now that the big tax paid DR must give her all the encouragement she needs. Also the one she is not asking for." They continue: "So no, DR. 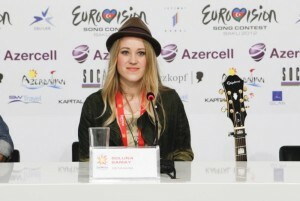 The 2012 Eurovision Song Contest has not ended yet. It has just begun. For you." After it was known that Denmark finished 23rd with just 21 points Soluna and her band headed straight back to the hotel with the two songwriters; Remee and Cheif 1. The latter said: "We need to tell these young people that this in no way is their fault. They did it so good." During the stay in Baku Remee had been out in the Danish medias fighting with DR about the lack of promotion for the Danish entry, but it remains unknown if that would have made any difference.